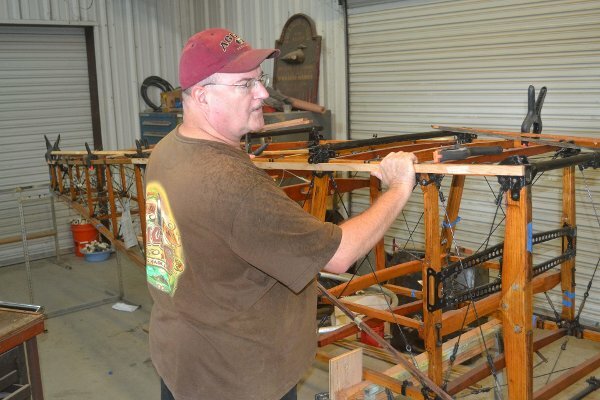 Dave Miller worked on the rubbing strips placed on the longerons and finished the strips for both lower longerons. This was a tedious and exacting task, involving marking off parts of the strip needing to be relieved to fit around the various bolt heads and steel fittings at each fuselage station. Steve Richardson spent a lot of time searching for electrical wiring for the T-1 blip switch. He had the control column / torque tube assembly looking very spiffy and the new wire is needed to replace seriously frayed wiring where the blip switch wires exit the control column. 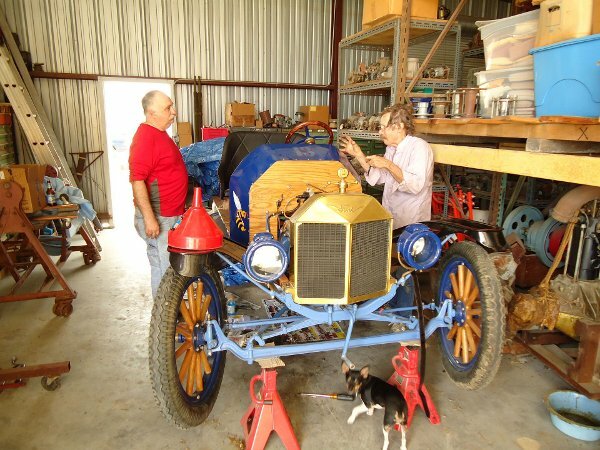 No wire was found, but Cameron Whitaker will buy some for the project at the Model T store near the A&M college campus! Steve and Tom Gaylord worked on reassembling the main gear for T-1 - the process was two steps forwards, one step back! Tom Miller did a drive by to help organize and inspire! The plan was to fire the airplane up, fly it, and take it to Lockhart for fuel. That plan didn't happen because the airplane is out of annual. Steve says the FAA is beginning to check all aircraft on the ramp for paperwork and such, so he insisted on finding all the paperwork for the Meyers before trying to fly it. When located the Meyers was out of annual by only three months or so! Kevin Monahan and Tom Gaylord put air in tires and such so flying would be possible. (Kevin went on to put air in all sorts of tires on the property!). At the end of the day the Meyers was on the shop pad so Steve could work on doing the annual during the week. Same game plan as the Meyers; fly it and get it refueled! However, the oil tank was empty and there wasn't any 120 wt oil on the property. After the tires were inflated the engine was pulled through after removing spark plugs so oil in the cylinders could drain out and the engine could be safely started without damage from hydraulic lock. However, with the low oil situation this aircraft was eventually pushed back into the hangar! Just moved around to provide access for the Meyers and Great Lakes. Went back into the hangar late morning when the property was hit with a rain shower. Various folks poked on the engine, but the exhaust valve on the one cylinder is clearly stuck open! Later in the week Kevin Monahan reported that he and Steve looked at the motor again and determined that the valve guide has actually worked loose and dropped down into the cylinder some. The Canuck is going to have to be parked for the Fall Fly-In and that cylinder pulled afterwards! Cameron Whitaker, Kevin Monahan, Tom Gaylord and Steve Hester all conspired to replace the inner tube on a model T tire (the driver's side front wheel / tire on the flatbed truck. Finally got the tire off the rim and discovered a basically new inner tube that had spent its short life creased and pinched inside the tire. But also Kevin said he could feel a thorn or something on the inside of the tire! Cameron also spent some time tuning up the TT's motor. Towards the end of the day Kevin Monahan and Cameron Whitaker worked on the Indian and got it running again! No seat, so no one rode it, but the engine fired up and ran nicely! I believe there are still some mechanical bugs to iron out before the Indian will be in really good shape. There were rumors that the Indian's seat would return soon from the saddle maker's shop where it is being recovered! Hope that is true!